Great triggering response and affordable pricing make Drumagog Basic a no-brainer., with Pro and Platinum getting outside of most home studio budgets. All versions share Advanced Triggering Mode, Multi-Sample support, 6 GB Sample Library, Visual Triggering and Room Samples. The Pro and Platinum versions have some extra goodies, such as Auto Align, Bleed Reduction, Hi Hat Tracking, Convolution Reverb, Morph Engine, Plugin Hosting and so on. Multiple samples can be triggered from one drum hit, typically overhead and room samples that were recorded from the same drum. Drumagog 5 comes with a number of drum samples, including Smart Studio .gogs (with Room Samples) as well as some 3rd party sound designers. The visual triggering window is present in all views, thus allowing the user better control over the material. Up to three room or alternative mic samples can be triggered from a single drum hit. All room and mic samples are phase phase-locked with each other. To compare versions please visit Drumagog's website. Installation is relatively simple. The version I was provided worked via a challenge/response scheme which spits out a code which has to be validated by Drumagog by uploading a challenge file, a response file then is generated, which in turn unlocks the software. In my case validation was quite cumbersome as I was on a special reviewer version which timed out constantly. Alternately, Drumagog can also be installed on an iLok key. I was allowed to use the Platinum version of the program for the duration of the review. It had all the options of the full Platinum version minus the samples, which weren't provided for the review. From first impression, visually and functionally the software appeared to be an improvement over version 4. One thing that became apparent right away was the enhanced precision of the tracking algorithm. It required fewer adjustments to get the triggering right and it seemed to less prone of over-triggering. The Platinum version also adds an extra goodie to the bag that brought quite a bit of excitement to this reviewer - the virtual instrument plugin hosting. 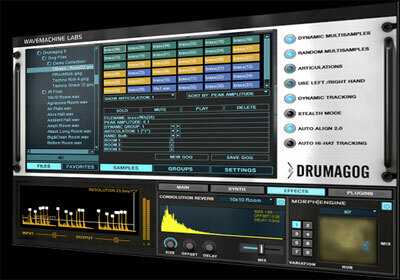 What this does, is essentially allow the user to load third party vst drum samplers, such as Superior Drummer, BFD and Ocean Way Drums and trigger these samples from within Drumagog. The effects and convolution reverbs also come in handy, although I prefer to use outside reverb plugins in order to match the drum ambience to the rest of the performance. When it comes to triggering, the way I work is to usually beef up or replace a kick and snare performance by adding outside samples that blend well with the tracked performance sound. For the most part I leave the rest of the kit as it was originally tracked. Occasionally I would also replace the other parts of the kit, but for the most part snare and kick are the bread and butter of triggering software, so I wanted to see how Drumagog will behave on a fast hard rock/metal mix. As it turned to be the case on this project, I had already picked some hits from BFD to supplement a darker kick and snare sound and add some crack to the head sound of both instruments. I duplicated the original tracks and fired an instance of Drumagog on each of the tracks and loaded BFD as a vsti plugin from within the triggering program. With some minor tweaking I managed to fine tune the triggering and bounce the new sounds to fresh tracks for mixing. Drumagog also fixed a few lackluster sections where the snare hit volumes were inconsistent. I exported several samples of the original snare sound from earlier in the song and was able to load the .wav files in Drumagog to use as samples. Then I just proceeded to trigger that section and bouncing the results to a new file. Resource handling on my recording machine was fine, and the latency adjusted option of the plugin and the Auto-Align 2.0 algorithm made sure that the triggered parts were locked with the rest of the performance. Even with the convolution reverbs on in both instances of Drumagog the hit on the system was manageable considering that I had about 40 tracks of audio with various plugins and two resource intensive reverbs already running in my effects bus. Considering the bells and whistles of the Platinum version, and especially its vst host handling, I'd be very hard pressed to recommend any of the step down versions, but at $379 (current price at drumagog.com) this might be out of many user's budgets. The Pro version offers most of the features of the Platinum at $289, and the Basic is quite bare bones so it would most likely not fit most user's needs. Great triggering response and affordable pricing make Drumagog Basic a no-brainer. Things get a bit complicated when we consider the Pro edition which packs more punch but is definitely not cheap at $289. The Platinum edition at $379 is also expensive by most home studio standards. I'd personally recommend the Platinum as Drumagog really shines there, but it is quite a hit on the budget, so if you plan to do more straightforward drum triggering and sound replacement - one of the cheaper options might be for you.